WELCOME BACK: It sure was tragic news about our astronauts last weekend. As you'veprobably noticed from many of our articles we really like keeping an eye onthe space program. While it's true that a lot of people didn't even knowthat we had seven astronauts in space along with the three in theInternational Space Station we were well aware of it. It really hit us hardand were sort of in shock for a couple of days. Our hearts and prayers goout to the families and close friends of all these heroes. We were looking at the number of people that have voted for our newsletterat Cumuli Newsletter Finder and it's pretty dismal. We put a lot of workinto bringing you this newsletter each week. Marilyn and I spend a good 40to 50 hours each week getting the projects ready and the news together. Thisis in addition to our regular day jobs which take up over 40 hours each. Inreturn for this we don't ask much. We would really appreciate it if youwould take the few seconds required to vote for The AllAmerican RunnerDuckReview newsletter. What this does is give us a lot greater exposure and therefore moregreat readers like you. Just click on this link, www.cumuli.com, and vote.So far we only have 143 votes. With over 6,000 subscribers to our newsletterthat's a drop in the bucket. In return for this great newsletter we areasking you to please take a couple of seconds and vote at www.cumuli.com.Thanks a million and we'll keep this great newsletter coming. A happy early Valentines Day to you! We hope that you make the best of a really fun day.One of the nice things about Valentines day is that there is not (generally)a lot of pressure to do a lot of gift giving. Just a nice card, flowers orsome candy is all that is really required. One of the really easy ways tosend a card is through the Internet. We have a link to 123Greetings.com on ourweb site that you can use for all occasions. They also have some nice giftsif you are so inclined. One nice feature of the site is you can schedule acard to be sent on a specific date. You can go there right now, pick yourValentine card and set February 14th as the delivery date. Your card willarrive without giving it any more thought. The best feature of this site isthat this service is FREE. As we've often told you, that's our favoriteprice. Give it a try, we think you'll like it. Remember to check out Ron Godin's rustic Adirondack art. It is really something to see. 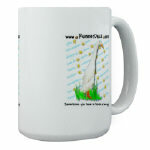 Just go to www.runnerduck.com/crafts.htm and see what he has for you. What's New This Week? As we mentioned above the AllAmerican RunnerDuck Review now has over 6,000subscribers and growing. We would really like to thank those of you thathave referred other people to our little newsletter. One of the mostpositive ways to grow is to have a friend tell a friend. The results of thatcan be phenomenal. Be assured that when you give us a referral that we neveruse their email address for anything but sending them an opportunity tosubscribe to our newsletter. We do not spam and do not support people orcompanies that do. Another thing we'd like to mention about our newsletter is that it'ssupposed to be a two way street. We enjoying talking to you every week butwe also like hearing from you. We also could use your help with recipes,kid's projects, gardening tips and woodworking projects. Having publishedover 100 newsletters sometimes the ideas come a little slow. If you have aproject or recipe you'd like to share we'd really appreciate hearing fromyou. Drop us a line anytime at newsletter@runnerduck.com. We've had some questions in the past about the security of our system andthe possibility of getting a virus from us. We go to great measures to tryand protect our system and more importantly you our readers. Most virus' aretargeted at Outlook because the evildoers get the most bang for their buckthat way. While we like Outlook a lot and all the nice interfaces like thecalendar, contacts, tasks and notes, we've found ways around them with otherprograms. First off our mailing list is maintained in a secure data base. Itis only used for sending out the RunnerDuck newsletter and has no path toany email program. Secondly we use an email program called The Bat whichworks really great as a mail client and handles virus email in a way thatthey cannot infect our computers. The bad news is that sometimes we getemail from our readers that have something attached that The Bat does notlike and we never get it. For your protection we always error on the conservative side ofthings. Our number one goal is to protect you, the subscriber, from all theviruses we see on a daily basis. In these days of so many bad people outthere in cyber land, we just thought you'd like to know that we really docare about helping to protect you. As a kid I use to love doing paint by number art. My grandparents had acocker dog called Snorkey and I once found a paint by number picture thatlooked like that dog. I still have that picture and here's a photo of it. Not bad for young boy. This weeks site is a paint by number art site thatwe've been having a lot of fun with. Not only is it a lot of fun for thekids but it's a great way to relieve stress after a tough day. You can spendhours filling in the colors to see what the finished pictures look like.We've done several and they've all been fun. Mark Feldman who has this site says "SegPlay is a fun, free, and challenging interactive artistic experience which allows you to color in detailed patterns of photographs and well known art images, without lifting a paint brush or crayon. Its the largest collection of Paint by Number patterns on the Internet". If you have a favorite site please send it to us so we may share it with the rest of our readers. Send it to duckmaster@runnerduck.com. Spring will soon be upon us and nothing makes a table more festive than these pretty spring place settings. I made these for my sister Susie's birthday party but I won't tell you how old she is. 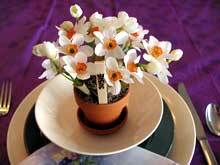 Small clay flower pots and saucers. Cut the floral foam to fit inside the clay pot. Press the foam into the pot. Using the Tacky glue attach some Spanish moss to the top of the foam. Add your flowers. You may have to cut them down and wire them using floral picks. 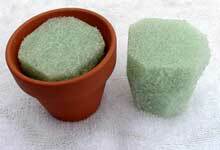 Glue the saucer onto the bottom of the clay pot using ceramic glue. Write the persons name on the Popsicle stick and poke it into the foam. It's just that simple and these really do dress up a table at your party. We love toys that do more than just sit around for you to stare at. Toys that can be made into something get the creative juices flowing and the young minds turning. Check out all the neat blocks, gears and models we have at the link below. Don't forget that The Tempos big swing band is available for hire. If you have a special event that could use the wonderful music of a classic big band be sure to contact thetempos@runnerduck.com. We'd like to celebrate one of the great musician's birthday's today. Toots Thielman turned 80 years old today. Toots is the greatest jazz harmonica player that has ever lived. His distinct sound has never been matched and is recognizable anywhere. This week's featured CD is just one of about 35 that Toots has made. This is another one of those essential artists you must have in your record collection. Here's a flavorful conservation tip. Are you a coffee drinker? Do you likethe way the coffee tastes near the bottom of the bucket? Well we don'teither! As soon as your coffee is done brewing pour it into a thermos andturn the coffee maker off. Your coffee will taste just like fresh brewed tothe last drop and you won't be wasting electricity cooking it down into athick goo. Once upon a time there was a young man who wanted to become agreat writer. "I want to write things the whole world will read",he declared, "stuff that will elicit strong emotions from peoplein every walk of life. I want my writing to make them scream, cry,howl in pain and anger!" He now lives happily ever after in Redmond, Wash., writing errormessages for Microsoft. Check out all the great products in the RunnerDuck Goodies Store. Show the world that you love RunnerDuck! Gourmet Potato Patties	How about something really good to go along with that wonderful breakfast you're about to fix? I think these potato patties will do the trick. Mix Cream Cheese, Flour, Salt, Paprika, Parsley and Shredded Cheese. Add Milk and Onion, mix until smooth. Gently fold in the beaten Egg and separated Hash Browns. Pour 1/4 Cup of the mixture onto a lightly greased skillet, medium heat, and spread to 3" in diameter. Makes approximately 10 3" pancakes. Every month we post a new recipe on our web page. Be sure and check out the NEW February recipe at the RunnerDuck Kitchen Store. A GREAT DEAL FOR RunnerDuck SUBSCRIBERS Have you ever wanted a really nice piece of cookware but thought it was just way too expensive to buy. Check out this week's special where you can save $100 on a very special piece of cookware. Every week we bring you some great savings from Cooking.com. These will change every week so we encourage you to check them out. Just use the link below to start saving. This week's recommended cookbook, "A Real American Breakfast", is a nice compliment to this weeks recipe. Mary from Chicago reviewed this cookbook as follows. The Jamison's have done it again. They have another hit book about food. Notice I didn't call it a cookbook. It surely is a cookbook but it is so much more. This book is a blend of great recipes, nostalgia, and beautiful pictures. This brings you back to a time in our lives when we ate breakfast as a family instead of a fast food drive through. Those smells that you used to wake up too seem to resonate from the pages. The recipes have been good for me to get my family together for those week end breakfasts once again. Also, we have week end guests quiet often and it is so nice to have such a variety of recipes to choose from vs the usual breakfast stand bys. In this time when we all seem to be searching for comfort foods, this is the best cookbook I have found. 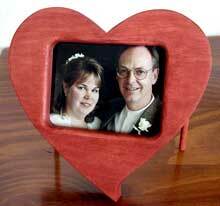 With Valentine's Day next Friday you should have just enough time to makethis really nice heart shaped picture frame. 6" X 6" X 3/4" wood. It depends on how you finish your frame as to what type of wood to use. If you plan to paint it you can use just about anything. If you are going to stain it red like ours you'll want to use a light wood like Maple. 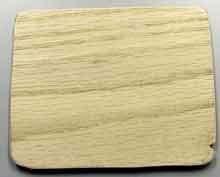 1/4" plywood 4" X 6". 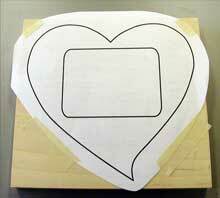 Using our pattern, www.runnerduck.com/images/heart-frame-pattern.gif, cut out the heart using a band saw or scroll saw. Drill a 5/8" diameter hole in each corner using a Forstner drill bit. 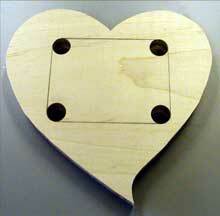 Using a scroll saw or coping saw, cut out between the drilled holes. Try toget as close to the tangent point of each side of the hole as possible. Thiswill save a lot of hand work later (speaking from experience :-). Sand the edges of the cutout until they are smooth and blend into the holes.A fine wood rasp works pretty good for this. 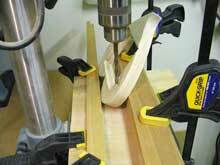 Using a 1/2" round router bit, radius the edges of the cutout. Lay your frame down on the 1/4" piece of plywood and trace the routedfeature of the cutout from the front. This is to make a backing for yourphotograph. You'll have to reach in with your pencil to strike a line. Cut out the 1/4" plywood following the line. Set up your drill press to drill about a 30 degree hole in the back of theframe for the support legs. Here's a picture of the simple set up weused. Cut the 1/4" dowel into two 4 1/2" pieces. You will have to adjust this tomake your frame sit level and at a good angle. Insert the dowels into the holes and mark them as required to level theframe. Do not glue the dowels into the frame. You may want to use the frame on thewall someday and this will make it easier to remove the dowels. Sand, stain and finish your frame. We used watered down red acrylic paint mixed with brown acrylic stain for our color. You can add glass to the frame and after you put your picture in you cantack the back in with brads. We hope whoever gets this gift will enjoy it as much as you enjoyed makingit for them. If you have a project that you would like to share please drop us a line and we'll help get it published in the RunnerDuck review. We are looking for woodworking, gardening, crafts and kids projects so send us your thoughts at projects@runnerduck.com. Be sure to wish your sweetie pie a happy Valentines Day next Friday. We havelots of nice gifts in our web site stores. Check them out before it's toolate. Also remember to send them an electronic greeting from 123Greetings.com.It's easy and fun. Do it now and set the delivery date for next Friday, thatway you won't forget. By the way, this really works great for anniversariesand birthdays also. It can keep you out of hot water if you are the sort ofperson that tends to forget these important events. If you forward these newsletters to your friends just drop us a line and we'll do it for you. Just send us their email address and we'll do the rest. Remember, we never share our email list with anyone, period! Just drop me a line or go to our registration page and sign up your friend. If you enjoyed this newsletter please tell a friend, if you didn't please tell us but in a nice way, we're very sensitive. All rights reserved, RunnerDuck Productions, 2000, 2001, 2002.